Paleontologists have identified the fossil of a horned dinosaur the size of a house cat that is the oldest of its kind ever discovered in North America - by 15 million years. The skull and the jaw of Aquilops americanus were found by Scott Madsen back in 1997 in what is called the Cloverly Formation of southern Montana. It languished for years before they published findings recognizing it as being a milestone artifact. "Scott initially thought it was generic, plant-eating dinosaur but it turned out it was one of these early horned dinosaurs. That is a really exciting find," said Andrew Farke, a paleontologist with Raymond M. Alf Museum of Paleontology and a co-author on a study in PLOS One Wednesday that described the discovery. "Up to this point, all that was known for horned dinosaurs were just isolated teeth and fragment bones," he said. "This new find is the first one that allows us to say exactly what kinds of horned dinosaurs lived in North America about 108 million years ago." "This guy is the beginning of the story in North America," said James I. Kirkland, the state paleontologist at the Utah Geological Survey who was not part of the study. Aquilops thrived during the early parts of the Cretaceous period, which ran from 145.5 million years ago to 65.5 million years ago. This was a time when horned dinosaurs became commonplace and when many insect groups, modern mammals and bird groups flourished. The Cretaceous period ended when Earth was struck by what is believed to be an asteroid. Farke said Aquilops was a plant-eater which measured about 2-feet-long, weighed about 3.5 pounds. "It was about size of a raven," Farke told CBS News. "You could hold the animal pretty comfortably in your arms. The fossil skull would fit very comfortably in your hand." 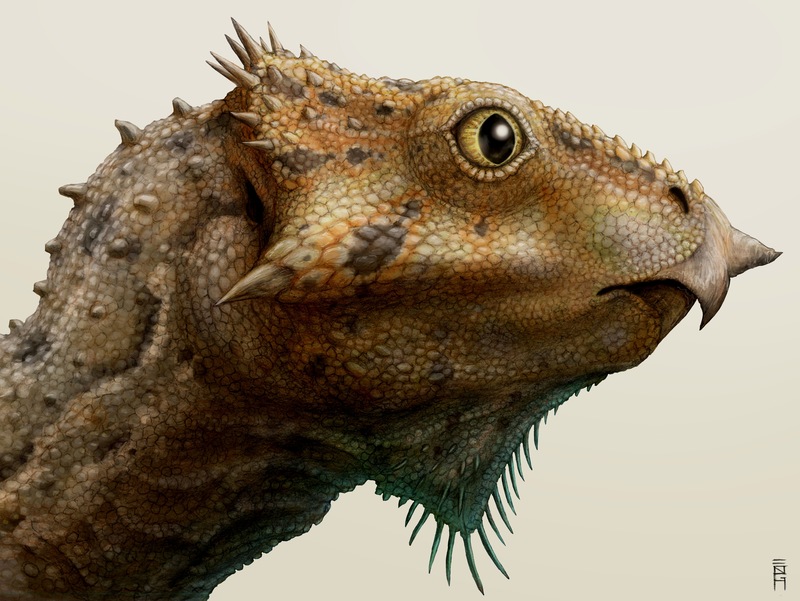 Kirkland was struck by how much smaller Aquilops was than horned dinosaurs that came later like Zuniceratops - which a team he was on discovered - and Diabloceratops. Some of the later animals, he said, were often as big as bison and were infamous traveling in herds of thousands and "mowing down the landscape." In addition to offering evidence that these creatures inhabited North America earlier than previously thought, the bones may shed light on how they got here. Similar horned dinosaurs which date to earlier in the Cretaceous have been found in Asia. In his study, Farke concluded that the discovery of Aquilops in North America "adds unambiguous support" to the theory that dinosaurs migrated from Asia to North America between 113 million and 105 million years ago. It also, he argued, evidences "a complex set of migratory events for organisms between North American and Asia later in the Cretaceous." This was a period when the continents were beginning to reach their modern position. As a result, this could have allowed animals to cross from Asia, through Siberia, into Alaska and then down into North America. "There was an influx of animals from Asia probably related to changes in ocean levels which would have opened up land bridges between some continents," Farke said. But Kirkland said he is not convinced that Aquilops is enough to prove animals were coming from Asia to North America at that time. He said it was probably more likely they came from Europe, since he believes "these little animals were all across the northern hemisphere." "The problem is that there wasn't really any Alaska then. It was island floating in the Pacific," he said of suggestions that animals would have made their way through Alaska to North America. "We don't have that land bridge at that point." Following this discovery, Farke said it is likely paleontologists will now go in search of other horned-dinosaurs fossils to further understand how they evolved. "There is about a 15 to 20 million year gap where we don't know what kind of horned dinosaurs were living in North America," Farke said. "Maybe that is when the ancestors of animals like Triceratops would have come to North America." Kirkland agreed, saying it would be ideal to find more fossils to go with horned dinosaur teeth that have been discovered and dated to around 98 million years ago. "I would love to find the animal that goes with those teeth. It is quite a bit bigger," he said. "I would be very interested in seeing what that animal looked and what it was doing. Did it have horns on its head? We don't know."